Admission Fees: $8 for adults, $5 for children. It's a state park, so your Yosemite or National Parks pass won't work here. Plan on spending a few dollars more to pick up the official guide, which includes a map that identifies and briefly describes nearly every building still standing, as well as several that aren't. It's a must have for first time visitors. 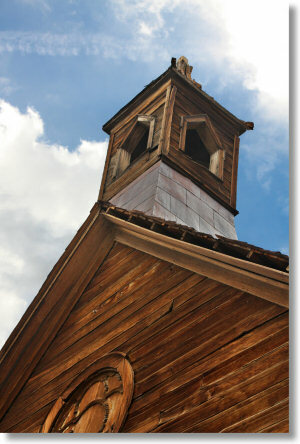 Why visit Bodie? Bodie is the biggest unrestored Old West ghost town in the west. Which would also make it, by definition, pretty much the biggest of its kind in the whole world. Much of this former community of 10,000 is gone - all the residents, for starters - but about a hundred buildings remain in various states of decay, including the jail, the firehouse, bars and hotels, houses - buildings from nearly every facet of gold rush life. One exception, the red light district, is just a strip of grass and sagebrush now, but you can still walk along the street where it once stood and put your imagination to what uses you think best. Bodie is preserved in a state of arrested decay, which means that the state will take steps to keep buildings from falling down (see the Swazey Hotel), but leaves them largely untouched, so they'll appear much as they did when the town was abandoned more than fifty years ago - albeit, obviously, a touch more weatherbeaten. Crowd Factor: Surprisingly high given how remote Bodie is, but perhaps less so given what an unmatched attraction it is. Figure on sharing its streets with a few hundred other wanderers on any given summer weekend. Difficulty: Practically none. The parking lot is within a hundred meters of the town's edge. There's a bit of an incline going from west to east, but nothing worth complaining about. If you wander up and down every street, you might get more than a mile's worth of walking in, but not by much. Best Time to Visit: In the summer, when the road is open. Bodie's elevation of around 8,400 feet is roughly the same as Tuolumne Meadows, and a little below the Tioga Road's high point of just under 10,000 feet. The Tioga Road is generally	closed from November to May (see the historical closing dates); figure about the same for the Bodie Road. It also pays to visit during operating hours, which are 8 - 6 during the summer and 9 - 4 in the winter. (Admittedly there's not much to operate in a ghost town; "operating hours" here means, "times when you can enter Bodie without getting arrested".) Check with the official site before you go to make sure the schedule hasn't changed. Nearest Bathrooms: If you've become weak-kneed from just walking past some of the riper pit toilets that grace Yosemite's trailheads (the Taft Point / Sentinel Dome trailhead is notorious in this regard), you may be moved to tears when you open the door to one of the bathrooms next to the parking lot here and discover running water and flush toilets. But it's better to be overcome by emotion than aroma, no? Nearest Snacks: Assuming you're arriving from Yosemite, 31 miles (50 km) southwest in Lee Vining. If you're in the Lee Vining area and feeling peckish, you should make a point of having at least one meal at the legendary Whoa Nellie Deli, found inside the Mobil station at the intersection of Highways 120 (the Tioga Road) and 395. It's widely regarded at the finest deli inside a gas station in the history of mankind. Hazards: The last three miles (5 km) of the road to Bodie are unpaved. Unlike Yosemite, Bodie isn't open round the clock; hours are 8 to 6 in the summer and 9 to 4 in the winter. (See the official site for confirmation.) Though the park is open year round, the roads aren't - during the winter, you'll need special equipment, such as snowshoes or a helicopter, to get to Bodie. This is a bonafide, un-disneyfied ghost town, so beware of nails, splinters, and broken glass. In its heyday Bodie had a stupendous murder rate, and park officials offer no guarantees that its bloodthirsty spirit won't rub off on you or your companions - there have been no studies done on the long term incarceration rates of Bodie visitors. Already been to Bodie? Add a Review.